Markets experienced significant declines last week. The S&P 500 lost 5.95%, the Dow dropped 5.66%, and the NASDAQ declined 6.54%. 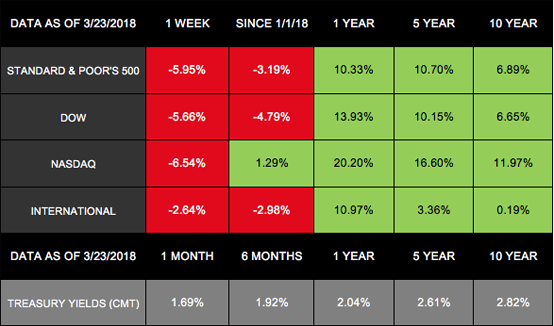 With these losses, all 3 domestic indexes had their worst weekly performance in more than 2 years. International stocks also declined, with the MSCI EAFE giving back 2.64%. What caused markets to stumble in this way? While various economic reports came out and the Federal Reserve raised rates again, another topic triggered the declines: trade war concerns. Last week, President Trump approved new tariffs on China as a punishment for taking American intellectual property. The tariffs could affect as much as $60 billion in Chinese imports - and Trump called this the "first of many" trade actions against the country. China indicated that it may retaliate and is "looking at all options" on how to respond. Apparently, everything is on the table - including targeting 128 American products, no longer purchasing U.S. Treasuries, and taking legal action through the World Trade Organization. The new China-specific tariffs combined with Trump's steel and aluminum tariffs earlier this month create growing concerns about a trade war. The market declines we experienced last week are largely a reaction to these fears. If the U.S. and China go back-and-forth adding punitive tariffs to each other's products, our economy could suffer. We could experience inflation, slower economic development, and higher interest rates, making expansion and growth harder for U.S. businesses. If the tariffs are successful, U.S. industries could benefit. Some U.S. steel producers are already boosting their production and hiring as the first round of tariffs goes into effect. The potential for a full-blown trade war exists, which could negatively affect the global economy. But this worst-case scenario is far from certain, and many opportunities exist to calm the rising tension. For now, we will continue analyzing exactly what is happening with tariffs and how different countries react. In the meantime, if you have questions about how these geopolitical changes could affect your financial life, we are always here to talk.